"I found myself saying to others around me "I love this agent! 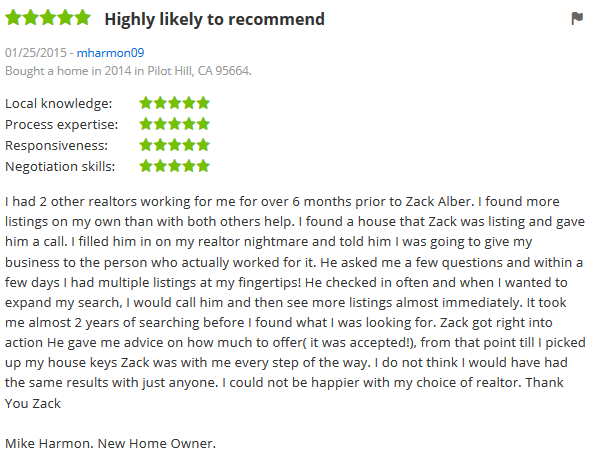 He is so attentive and reliable and if he doesn't answer his phone, he calls you right ... more "
"I had 2 other realtors working for me for over 6 months prior to Zack Alber. I found more listings on my own than with both others help. I found a ... more "
"Zack Albert is the best real estate agents I have ever seen before. <br/><br/>First thing I like about this guy is that he does not give you a bs ... more "
Get Your FREE Market Evaluation & A Home Warranty Offer Today!